Milan is a country with the Lombard culture and the ability to form Italy. 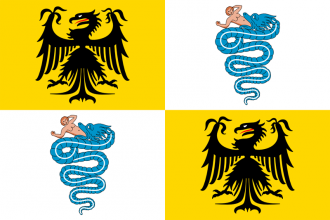 If Milan has a regency or low legitimacy it is possible to institute the Ambrosian Republic in Milan. This action will give Monarchy type neighbours a Casus Belli on Milan allowing them to force Milan to return to the monarchy government type. The Ambrosian Republic gives Milan access to a unique government form with increased morale for its soldiers and greater tax income. Milan can form the nation of Italy. Milan is one of the stronger Italian countries at the start of the game. Although starting out with only 4 provinces, it possesses a solid economy, good manpower reserves, and most importantly, quite a few opportunities to expand. As Milan is surrounded almost entirely by HRE members in the beginning, an early alliance with Austria could be advantageous. An allied Emperor will generally not interfere with Milan's expansion inside the HRE, so long as Milan itself remains within the HRE. This situation is likely to change in 1490, when the Shadow Kingdom event causes all Italian countries to leave the HRE. From outside the HRE, it will no longer be possible to attack HRE countries (e.g. Switzerland) without incurring the wrath of the Emperor, even if the Emperor is an ally. If there's something even more important than a powerful and versatile army for Milan, that is diplomacy. As yet another princedom hungry for glory trapped within the HRE jungle, Milan must gather a reliable set of allies to succeed; not only for using them to aid you in conquest but also to deter the bigger fish from attacking. To do this, swift diplomatic maneuvers are key. And also, keep in mind that large, powerful friends (e.g. France) are nice, but loyal, yet moderately powerful friends (e.g. Bavaria) are better. It is usually better if Milan avoids threatening the southern German states too early, as the sheer number of princes will greatly speed up the formation of a coalition against Milan. Milan should immediately pick Venice as a rival (As Venice will almost always rival Milan too), with the objective of reconquering Brescia. If Austria has ambitions to conquer Venice, then allying Austria to get them to fight Venice would be an easy way to defeat Venice, since Venice isn't an HRE prince. Mantua is a very easy province to take, and will provide Milan with a useful amount of tax when conquered, but you must be careful about upcoming revolts. Same goes for Ferrara, albeit it is a little bit less vulnerable because of its 2 provinces and the ability to acquire more allies. Lucca and Florence should be the next targets, but watch who they're allied with. If they're allied with a relatively powerful nation, wait for a moment of weakness, then spring on them before any other nations decide to do so. After steamrolling Siena, The Papal State will be a tough challenge, since if the curia controller dislikes Milan, then declaring war on the pope is a way to get excommunicated faster than you can say "deus vult". For this reason, it might be worth considering switching to Protestant or Reformed to avoid the excommunication penalty, as well as the global relations malus with Catholic nations for being excommunicated. When it comes to Naples, it is generally situational. If Aragon or Castile turned Spain diploannexes Naples, then it will be necessary to declare war on those nations. Otherwise, if Naples is independent, then go kill them as long as they aren't in touch with any powerful allies. If Naples decides to ally, for example, Albania, Tunis, and Cologne, then go ahead and murder Naples. Surprisingly, Switzerland is a fairly easy target as well. A pair of decisive battles (use mercenaries if necessary) will leave the Swiss army exhausted and unable to counterattack, allowing Milan to capture a province or even two. Savoy is a decent ally which will assure Milan's security from other north italian states, albeit it can get annoying to honour said alliance as Savoy often embarks itself in wars against (or is the target of) Burgundy, for instance. Austria will assure Milan's independence much better than Savoy, but unlike Savoy, Austria will not help Milan if you call them as an ally against a member of the HRE. It's nice to have them as a defensive ally, though - as long as they stay emperor, of course. Genoa can, again, be either a friend or a foe. As a friend, Genoa can provide protection for Milan, but prevents a possible conquest against them in pursuit of a seaport. As a foe, this is possible, but Genoa's power must not be underestimated, for its various provinces in the Mediterranean and commercial clout in Crimea more than make up for their only 2 provinces on the Italian mainland. Hungary will serve as a good counter against Venice. This page was last edited on 29 November 2018, at 21:57.